TinyCAD is a program for drawing electrical circuit diagrams commonly known as schematic drawings. It supports standard and custom symbol libraries. It supports PCB layout programs with several netlist formats and can also produce SPICE simulation netlists. It is also often used to draw one-line diagrams, block diagrams, and presentation drawings. X-TinyCAD is a circuit design program whose purpose is to help you draw electrical circuit diagrams (schematic drawings). It comes with support for PCB layout programs with several netlist formats and is able to deliver SPICE simulation netlists. No installation is required to use this tool. 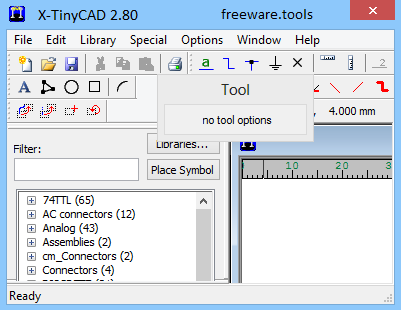 The tool is designed as the portable counterpart of TinyCAD. Its portable status brings several advantages to your system. Your Windows registry does not get clogged up with extra entries. You may copy it on any USB flash drive or other devices and carry it with you. The GUI provides quick access to a list with symbols that you can place in the working environment using simple click-and-point actions. There's also support for a preview mode which is revealed each time you click on an object. In addition, you may move components with the aid of the drag-and-drop support and resize each item. A small floating window is displayed each time you add a component in the drawing. This panel allows you to insert the item at a predefined position (up, down, left or right) and show power pins. X-TinyCAD lets you perform a series of basic editing tasks, such as cut, copy, paste, or delete components. Plus, you may flip or rotate items to different angles, zoom in or out of the drawing, and insert custom pictures (JPG, PNG, EMF, BMP) from your computer. Undo and redo options are also available in case you make mistakes. Other editing features worth being mentioned allow you to insert user-defined text messages, polygons made up of lines, ellipses, rectangles, arcs, as well as bus name, join, and bus. The schematic drawings can be printed or exported to PNG or EMF file format. Projects can be saved to a file on your computer so you can import them in the future. The application gives you the freedom to work with a rich-featured library of components. You may import data from MDB, IDX or TCLib file format and perform searches in order to quickly identify an object in the list. You may work with various items which are grouped in different categories, such as AC connectors, Assemblies, Connectors, Mechanical, Microcontroller, Passive, Switches, and Symbols. X-TinyCAD allows you to define the drawing colors for the wire, junction, no connections, power, bus, pin, and background. There's support for settings that help you alter the grid and ruler, enable an automatic wire configuration mode (snap and drag wires, place junctions), and automatically save backups at a custom number of minutes. The utility offers you the option to export the design's netlist for importing data into a PCB drawing program. You may save it to different formats, such as PADS-PCB, Eagle SCR, Protel, gEDA PCB, or XML. A verification tool can be used for identifying errors related to duplicate references, unconnected items, output connected to an output, unconnected nets, and multiple net names on same net. Last but not least, you may generate symbol references, create a parts list for the design and export data to plain text or CSV files, generate SPICE netlist, and add another design as symbol.